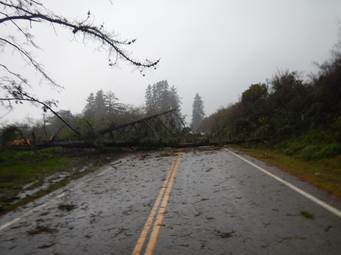 MONTEREY COUNTY — Caltrans has received confirmation from National Weather Service (NOAA) data that the significant storms have passed in the areas of Mud Creek (PM 8.9) and Paul’s Slide (PM 21.6) on State Route 1 in the Big Sur area. Caltrans Geotech, Maintenance Design and Maintenance crews assessed all road areas within the closure limits earlier today. Contractor and Caltrans crews are busy cleaning and clearing slide material from the roadway. As a result, Highway 1 will remain closed to through traffic until tomorrow, Wednesday, Feb. 6 at 4pm due to heavy mud and boulders on the roadway. However, section of Hwy. 1 at Mud Creek will fully reopen to thru traffic by 4 pm today, Tuesday, Feb. 5. Motorists will encounter a flagging operation tomorrow with one-way reversing traffic control at Mud Creek to allow for Caltrans to continue roadwork in this area. More pictures will follow as our crews onsite are out of cell service. An update is tentatively scheduled for mid-morning tomorrow, weather and progress dependent.